Poroshenko congratulated Belarus President on Independence Day. 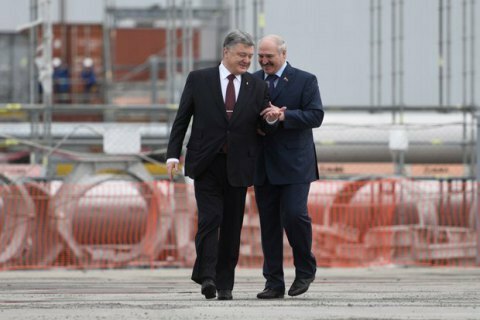 Ukraine's Petro Poroshenko sent a congratulatory letter to the President of Belarus Alyaksandr Lukashenka on the occasion of the national holiday, the Independence Day of the Republic of Belarus, as reported on the president's website on 3 July. Poroshenko stressed that the development of good-neighbourly relations based on the principles of equal partnership and trust is the top important priority of bilateral cooperation between the countries. "The effective coordination of joint efforts to implement practical tasks contributes to the successful implementation of the agreements reached during our meeting in April. I am confident that your forthcoming visit to Ukraine will be another important step in deepening the constructive dialogue between the two countries," Poroshenko said. In April, Lukashenka took part in the events dedicated to the anniversary of the accident at the Chernobyl nuclear power plant. He assured Poroshenko that "no one will be able to draw Belarus into the war against Ukraine." Earlier, in February, Poroshenko ruled out an offensive of Russian troops through Belarus, but the threat of full-scale aggression on the part of the Russian Federation is still relevant. Lukashenka, in turn, promised not to allow using his territory for hostile actions.